In August, the African Centre for Biodiversity released a report titled N2Africa, The Gates Foundation and legume commercialization in Africa, as a result of a 3 year research program. This report focuses on the N2Africa program, which claims to be an initiative for the development and distribution of new legume varieties, as well as promotion of the use of inoculants and synthetic fertilizers, in order to develop a commercial legume market for smallholders. The program is backed by a conglomerate of organizations, including the Consultative Group on International Agricultural Research (CGIAR), public research institutions, farmer associations, and universities. The majority of funding, however, comes directly from the Bill and Melinda Gates Foundation, with smaller donations from its affiliate, the Howard G. Warren Foundation. Legumes have a long history as a food source in Africa due to their high nutritional value. 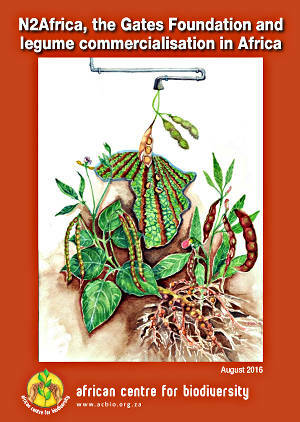 Although the development of new legume varieties offers possibilities for nutritional and ecological benefits for smallholders and the African population, the program follows the pattern of other Green Revolution initiatives – resulting in problems such as economic instability, land holding risks, and misplaced objectives. This report outlines the problematic potentials of the N2Africa Program as well as projected outcomes. The report points out the parameters that should be recognized as the primary goals of the initiative (the nutritional and ecological benefits) and how these parameters are actually thrown into a secondary category of developmental goals, behind international commercial market development. CAGJ and Community to Community are co-hosting the 2016 Food Sovereignty Prize, working closely with US Food Sovereignty Alliance members across the country, including WhyHunger, whose co-founder authored this piece on the fundamental differences between the World Food Prize, and the Food Sovereignty Prize. Author EditorPosted on September 27, 2016 September 27, 2016 Categories NewsTags food security, Food sovereignty, GMO, Green RevolutionLeave a comment on Food And Hunger: Which Prize Takes The Prize? The on-going debates regarding whether or not GM food is safe for human consumption involve GM proponents relying on short-term research studies which do not allow for sufficient data collection to gauge the long-term and multigenerational effects of GM food consumption. Because some other studies have indicated that there are likely to be adverse health effects after long-term GM consumption AGRA Watch believes that independent scientific long-term research studies must be performed in order to enlighten the GM debate. If interested in learning more, please visit the Council for Responsible Genetics. Mark Lynas, claiming to be an early GM opponent, is now the biotech industry’s darling as he recants the errors of his ways. The Gates Foundation has picked up the industry spin and in a blog posted by Sam Dryden, the Gates Foundation’s director of agricultural development, Dryden discusses how “refreshing” it was to hear Lynas apologize for the “myths” he spread about GMOs during his time as a self-proclaimed anti-GMO activist. Additionally, the Bioscience Resource Project has compiled a list of recent articles from experts putting the Lynas scientific misrepresentation into perpective. The Bill & Melinda Gates Foundation has granted the International Rice Research Institute in the Philippines $1.3 million to help develop Golden Rice, a genetically modified strain of rice containing beta-carotene which the body may be able to convert to vitamin A. In recent weeks, two news stories broke hyping up the expectations of Golden Rice. In a response to the exaggerated news stories, the International Rice Research Institute issued a clarifying statement. Michael Hansen, senior scientist at Consumers Union, has also discussed the hype regarding Golden Rice’s claim to combat vitamin A deficiency. According to Hansen, there have been three versions of the genetically modified rice varieties to date. The first version (GR1) had low levels of beta-carotene– a precursor to vitamin A–so low in fact, that a report by Greenpeace exposed that an individual would have to consume TEN pounds of the rice in order to get the desired levels of beta-carotene. Although the second version (GR2) had higher levels of beta-carotene, the real issue, Hansen states, was that because the genes were easier to insert in japonica varieties of rice, people in South Asia (who were accustomed to indica rice) would not eat the new variety. “It wasn’t until 2010 that they had been able to cross GR2 with local indica varieties and get plants out into the field to test. We still don’t know the levels of beta-carotene in the GR indica varieties. In addition, they still haven’t done the proper safety testing…” says Hansen. Furthermore, according to Vandana Shiva, in one village she is familiar with, over 350 varieties of plants grow (dismissed as “weeds”) which are dietary sources of vitamin A. It is also likely that without other nutrients in a balanced diet, the child’s body may not be able to manufacture vitamin A from the precursors. Last week the Supreme Court heard the case of farmer Vernon Hugh Bowman vs. Monsanto regarding the legal question of whether the sale of a patented seed falls under the general doctrine of “exhaution” of the patent monopoly (that the sale of a patented item ends the patentee’s control over its uses), or if a seed should be treated differntedly from a manufactured artifact. To ensure farmers will buy new seeds each season, Monsanto requires that farmers only plant the company’s genetically engineered seeds for one season. Bowman planted Monsanto’s GE soybean seeds from a local elevator and consequently violated Monsanto’s restrictions. He appealed the decision to pay the seed giant company $84,000 to the Supreme Court. The questioning of the lawyers by the Justices during the hearing indicated that the Court will probably conclude that patent control of seeds extends past their sale (ie, that “exhaustion” does not apply to “self-replicating” patented items). Two of the world’s richest men, Bill Gates and Carlos Slim, participated in a ribbon-cutting ceremony for new laboratories at the headquarters of the International Maize and Wheat Improvement Centre (generally known by its name in Spanish, Centro Internacional de Mejoramiento de Maíz y Trigo, CIMMYT) Please see http://mg.co.za/article/2013-02-14-gates-and-slim-open-new-research-centre-to-aid-global-food-security [mg.co.za]. Although the two articles referenced above, and in particular the latter article by Gates, suggest that CIMMYT promotes “sustainable” solutions to world hunger, AGRA Watch’s research shows projects previously funded by the Gates Foundation do not promote sustainable or agroecological approaches to farming. So skeptisism here appears warranted.